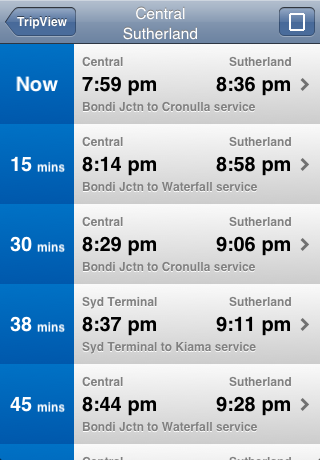 TripView displays Sydney Train/Bus/Ferry timetable data on your phone. It features a summary view showing your next services, as well as a full timetable viewer. 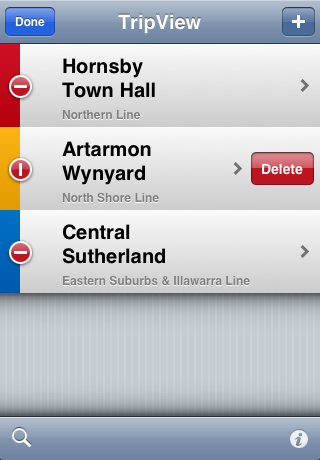 All timetable data is stored on your phone, so it does not require any network access. For more updates and info, follow me on Twitter. Departure alarms (time based) and arrival alarms (time/distance based). These screenshots are from the original version of TripView, released in 2009. The app has improved a lot since then, and many more features have been added. For more recent screenshots, take a look at the Apple App store or the Android Market. 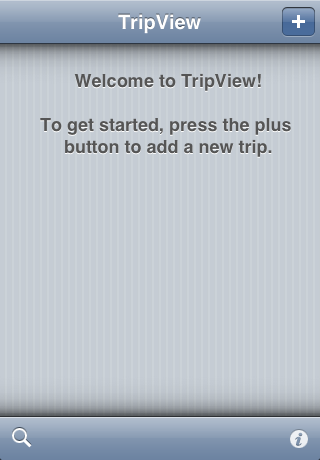 This is the initial welcome screen that you see after starting TripView for the first time. The plus button adds a new trip preset, the magnifying glass gets directions to nearby stations, and the information icon shows version and contact information. If you press the plus button on the main screen, it will take you to the New trip screen. You can choose your source and destination stations, as well as a train line. Pressing Save will take you back to the main screen. 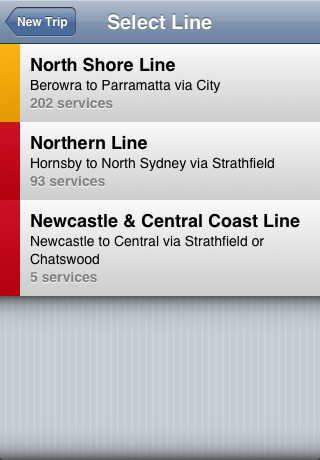 Normally, TripView will only show trains that stop at both your source and destination stations. However, if you change "All Trains" to On, it will show all trains from your source station in the direction of your destination, even if they don't actually stop at your destination. If you click on one of the station names on the New Trip will take you to the Select Station screen. 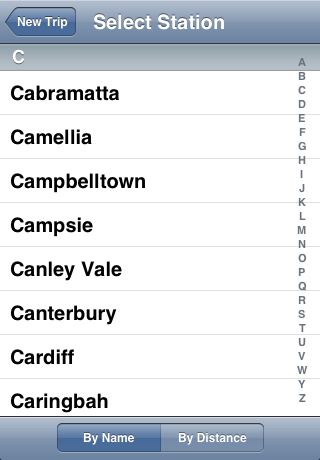 By default, stations are sorted by name. You can click on one of the index letters on the right hand side of the screen to quickly jump to stations beginning with that letter. If you are selecting the destination station, TripView will only show stations that are on the same line as your source station. If you click on the By Distance button, TripView will sort the stations in order of increasing distance from your current position (using the iPhone's built-in GPS). This might be useful if you're in an unfamiliar area. If you click on the line name on the New Trip screen, it will take you to the Select Line. This shows all the lines that connect your two selected stations. Lines are sorted in order of increasing number of services. This is the total number of services for weekend and weekdays. After you've selected your stations and line, you can leave the New Trip screen by pressing the Save button in the top right hand corner. This will take you back to the main screen, where you'll see the new trip that you just added. If you click on a trip button on the main screen, it will take you to the Summary View. This shows the next 20 trains from your source station to your destination, along with the ETA, departure and arrival times. This view updates in real time, so you can keep it open while you're walking to your train. For each train, TripView will also show the starting and ending stations (e.g. 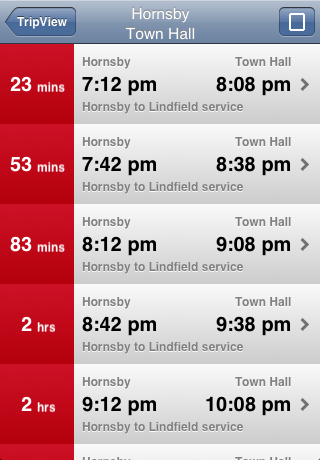 Hornsby to Lindfield service). Sometimes it's useful to know the type of train that you're catching. Some services are faster/slower, or more or less crowded than others. Clicking on any of the trains in this list will take you to the Timetable View, where you can get a full list of stops for that train. Here's another shot of the Summary View. 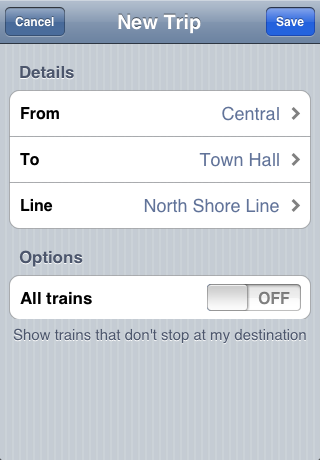 The difference is that in this screenshot, the All Trains option was turned on (see above). 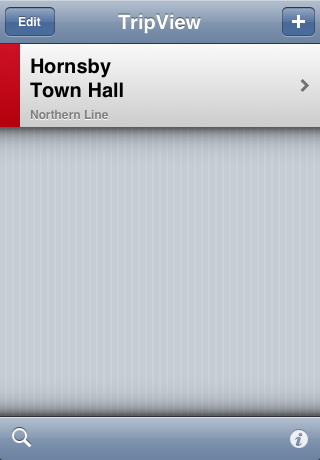 TripView is also showing trains that don't stop at Town Hall. Note the little button in the top right corner. That will take you to the Indicator View. This is the Indicator View. It's a replica of a CityRail plasma indicator screen. It updates and scrolls, and looks pretty much like a real indicator. Pressing the button in the top right corner will take you back to the Summary View. Or, if you press the TripView button in the top left hand corner, you will be returned to the main TripView screen. TripView will remember if you prefer the Indicator View or the Summary View, and when you click on a trip on the main screen, it will take you back to whichever view you used last. 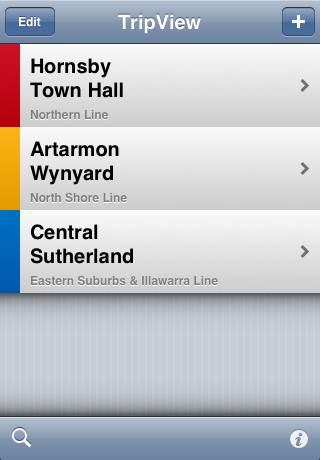 This is just another example of the Summary View, for the Illawarra line. Note that most views in TripView are color coded according to the current train line. 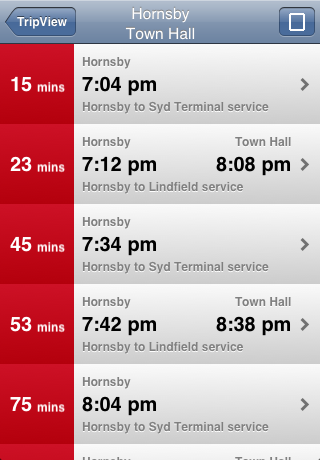 This is the Timetable View. You can scroll up and down through the stop list for the current train. Your source and destination stops are highlighted in bold. 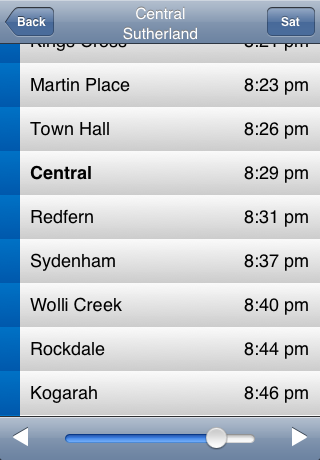 You can click on the arrow buttons, or use the slider to quickly scan though all the trains on the current day. 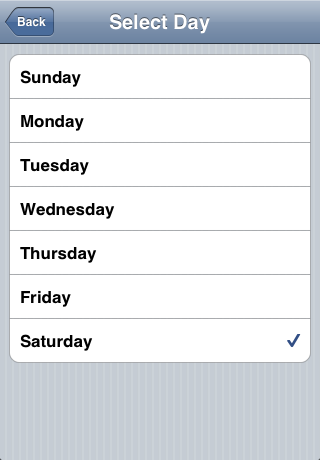 The weekday button in the top right hand corner lets you switch to the timetable for another day. 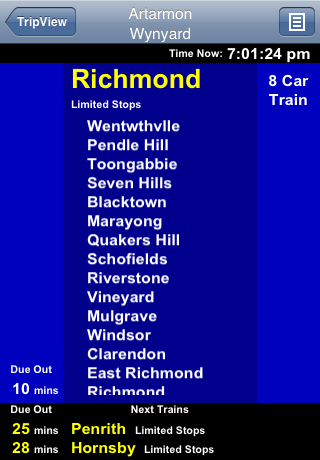 Note that Timetable View also respects the All Trains configuration setting. So if All Trains is enabled, you'll see all trains from your source station. Otherwise you'll only see trains that stop at your destination. This is the Select Day view. It lets you quickly jump to another day when browsing the timetable in the Timetable View. This is the Get Directions view. You can get to it by pressing the magnifying glass button on the main view. 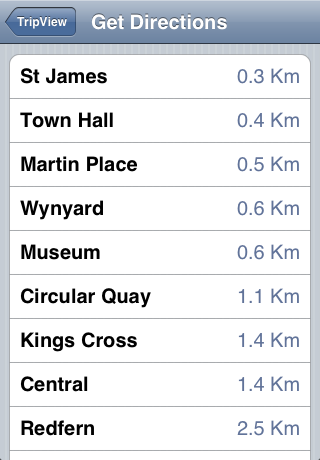 It uses the iPhone's built-in GPS to find your current location, and show you a list of all your nearest stations, sorted in order of increasing distance. This list will dynamically update as your walk around. If you click on one of the stations in the Get Directions view, it will launch the iPhone Maps application, and show you directions from your current location to the selected station. Here is another shot of the main view, with several trips defined for different train lines. If you select the Edit button in the top left hand corner of the main view, you will enter edit mode. This works the same way as edit mode in other iPhone applications. Clicking on one of the red circle icons will display a delete button for that trip. Click on the delete button to remove the trip. Also, clicking on a trip while in edit mode will take you to the Edit Trip view. 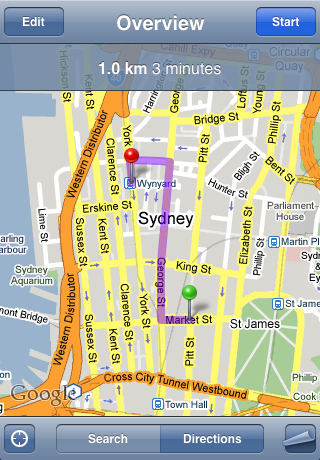 This is similar to the New Trip view, but it allows you to modify an existing trip.